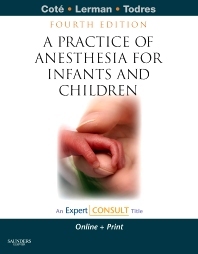 Extensively revised and updated, and in full-color throughout, the new edition of this popular text delivers practical advice on the safe, effective administration of general and regional anesthesia to infants and children. More than 50 internationally renowned experts—and a brand-new editor—discuss standard techniques as well as the very latest advances in pediatric anesthesiology, keeping you on the cusp of today’s best practices. Chapter after chapter, you’ll find authoritative guidance on everything from preoperative evaluation through neonatal emergencies to the PACU, as well as more than 1,000 illustrations that clarify concepts. And, as an Expert Consult title, this thoroughly updated 4th edition comes with access to the complete fully searchable contents online as well as video clips of pediatric anesthesia procedures, pediatric drug dosage calculators, extended references, and downloadable images for use in electronic presentations. Reviews underlying scientific information and addresses preoperative assessment and anesthesia management in detail to help you make better informed decisions. Provides guidelines for postoperative care, emergencies, and special procedures in one single source for your reference convenience.